“Look, do you want a two-hour lecture on quantum physics?” a man named Miguel asks a man named Peter. What sane person would say yes to a question like that? Spider-Man video games seem like a natural fit for the open world genre, with New York City and its towering skyline practically serving as a jungle gym for the swinging superhero. Some of his more successful video game endeavors have captured that sense of freedom. 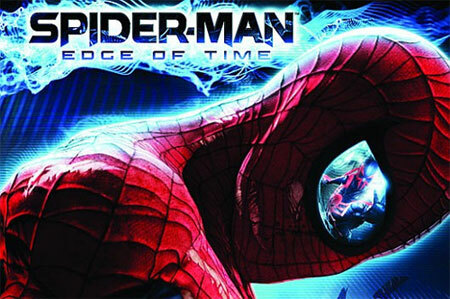 Spider-Man: Edge of Time eschews this structure for a more linear time-traveling narrative with two Spider-Men, which is down from the four featured in last year’s Spider-Man: Shattered Dimensions, also from Beenox. Edge of Time thrusts you into the middle of two timelines, starring the famous Peter Parker in present day and Miguel O’Hara from the not-so-distant future of 2099. Thanks to the evil work of an Alchemax scientist, they have to work together to save both their timelines and the entire space-time continuum. (Funny how that whole continuum is only ever mentioned in the event of imminent universal catastrophe.) Peter and Miguel are psychically linked by a wormhole or some other pseudo-scientific hand-waving, so they can talk to each other across the timelines. See, it all makes perfect sense. Since this is a time travel story, of course the theme of cause and effect will be explored and exploited for dramatic license. However, the causes usually amount to “punch this object until it explodes” and the effects are whatever occurrence the writers felt necessary to help or hinder the heroes at that specific moment. The plot and the gameplay sequences that string it together feel haphazard and arbitrary as locations and enemies morph randomly around you. It’s disorienting rather than engaging and in the end, I found it difficult to make myself care as it’s painfully obvious that the series of unfortunate events will eventually result in a positive denouement for the protagonists. You’ll switch between the two heroes as the story progresses, which left me with the odd feeling that I was missing out on half of the adventure. Oftentimes you will hear your uncontrolled counterpart complaining of some distraction or urgent circumstance, and I couldn’t help but think that whatever that particular Spider-Man was up to sounded more exciting than the activities of the Spider-Man I was currently manipulating. Maybe because everything you do in the game isn’t that interesting. All of this could be mostly overlooked if the gameplay was good enough to engage and entertain. It isn’t. The two Spider-Men have only moderate variances in their repertoires, and the entire game can be completed by mostly relying on the most basic moves. Little strategy is required aside from mashing a button to pummel your foes, then mashing a different button when some of them block your attacks. Combat then devolves into hitting and then running – err, swinging – away from enemies to regenerate your health. Because you spend the entirety of the game in a single building, even the fact that you’re actually in two different timelines opaques as you slog through seemingly infinite waves of bad guys in multitudinous homogeneous rooms. I even forgot if I was in the present or future at times. One of the rare kindnesses is the Spidey Sense power, which not only highlights your next objective, but also the linearity of the game as you punch objects and enemies to find keys and advance to the next incidental objective your arachnoid analogue demands. Speaking of demands, both heroes pretty much never stop making them, which means I got to enjoy logorrheic banter from the mouths of not just one, but two Spider-Mans. This would be a good thing if the writing could match the actors’ performances. Instead, I was tormented by an unending stream of superhero clichés and abrasive requests from whichever Spider-Man I didn’t happen to be controlling at the moment. The most aggravating part about all this is that aside from a couple rare instances, there are no time limits for completing your objectives, making all the yelling and urgency feel false and hollow. I could keep going, but there are few things to praise and too many to complain about in Edge of Time. Even with plenty of collectibles, challenge rooms and other would-be incentives to return, the game felt like a chore and I was happy to see the ending. Listening to the Spideys bickering like an old married couple is tiresome, the combat is tedious and repetitive, the checkpoints and horrible free-falling sequences frustrating. While Edge of Time boasts some decent production values, it’s disappointing the end product is just not very good. This entry was tagged Total PlayStation. Bookmark the permalink. Hi Nathan, you applied for a news writing position at Neowin.net but forgot to leave any contact details. Please email me so we can discuss further.